Got home from work at 3:30PM today and was feeling sick and congested all day. Even though I’m sick I still wanted to run. I decided that I would make a run to the US/Mexico border and take pictures of things of interest along the way. My time didn’t suffer so much from taking the pictures, taking those was quick didn’t even give a chance for my heart rate to drop much. All the friggin crossing lights is what slowed me down. When I hit 8 miles, I told myself well, I’ll just run till I get to 9 miles and when I got to 9 miles I thought; I WANNA DO 10!!! So I ran and ran and I ended up running 10.26miles/16.51Km in 1:52:01minutes avg pace 10:55/mile. I’m SO JAZZED!!! I ran 10 Miles! that’s TEN Miles! woo hoo.. “party time, excellent!” This is the first time I’ve run 10 miles since the 1970’s – yes I’m that old. I could have run further if my legs and knees would let me. Anyhow, I’m high on getting to ten. On the way to the border and in the first mile I passed the B-24 World War II era Liberator bomber wing that sits atop Montgomery Waller Community Park, more than likely built in the building I work in. If you ask the locals here the urban legend is that the wing is a memorial for a plane that crashed in that area. 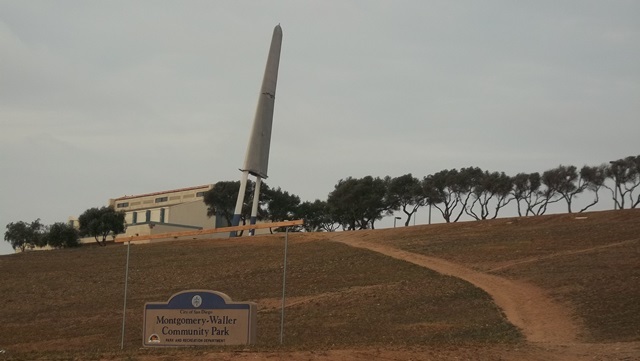 But the truth is it marks the place where John Montgomery made the first controlled flight on a glider on August 28, 1883. 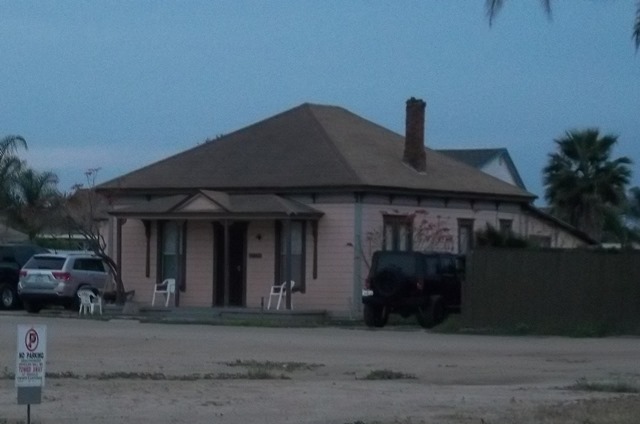 Just past the first mile you cross a set of train tracks and trolley tracks on the other side sit a very old house. I don’t know the age of this house but it looks to be old enough to have been a stop for either the stage coach or for the train that ran past its front yard. Perhaps one day I’ll stop in and talk to the owners to see if they know the history of this house. It’s a house I would not mind owning to use my skills to return it to its former glory. 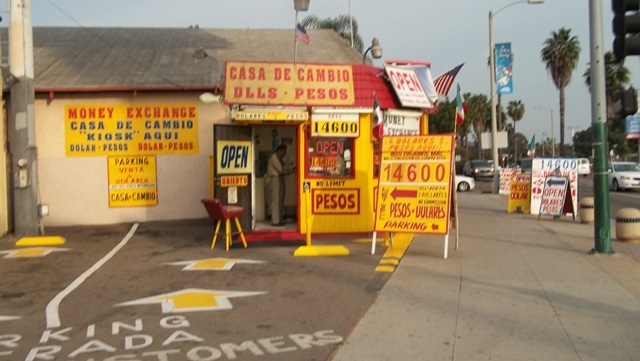 One of the many money exchange booths that line San Ysidro Blvd. truth be known you get better deals in Mexico when you buy with US Dollars so I never really understood the need to exchange your money as it is I use to get stuck with small amounts of Mexican money after spending time there. We no longer enter Mexico the cartels, rapists, and kidnapers have made it so visiting is just not worth the risk. 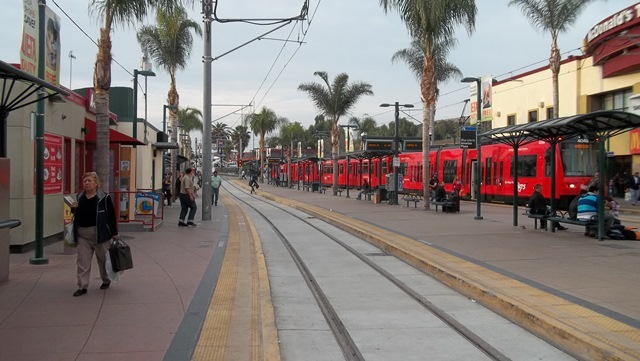 Welcome to downtown San Ysidro! 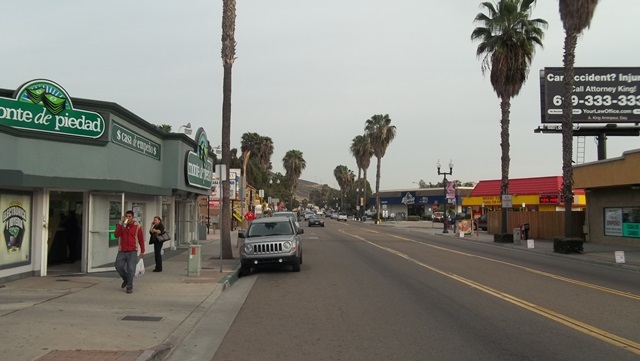 Most southern town in San Diego County. 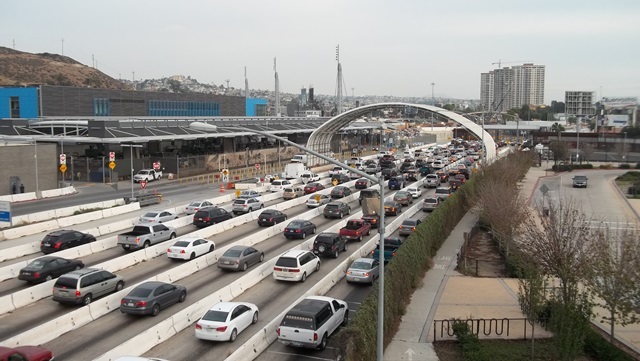 You don’t need to cross over the border in to Tijuana, Mexico to experience the sight, sounds, smells and car emissions you would find there; you need only visit San Ysidro the dirty arm pit of San Diego. 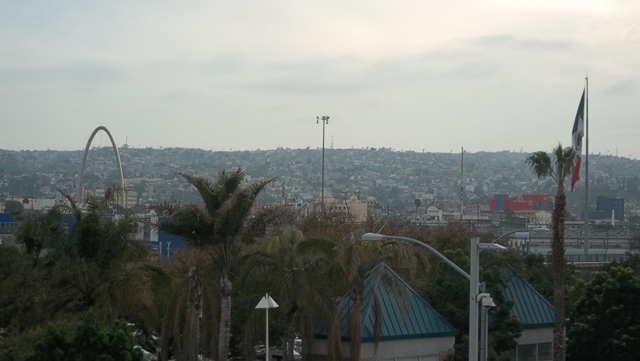 Blessed with the sewage smell of human feces from the Tijuana River mixed with the foul exhaust from cars burning high sulfur Mexican petrol. You’ll not escape filling your senses, and lungs, with the odors only available in third world countries, when you visit. But wait, there’s MORE! Experience the thrill and excitement of crossing the street without getting hit or the call of a woman looking for a date. Taking just a slight detour behind a building, there to my amazement was a wonderful alter paying homage to the mother Mary in the middle of so much squalor. Where other areas thick with garbage and graffiti this area was clean no litter to be seen. Beautifully landscaped and calming. 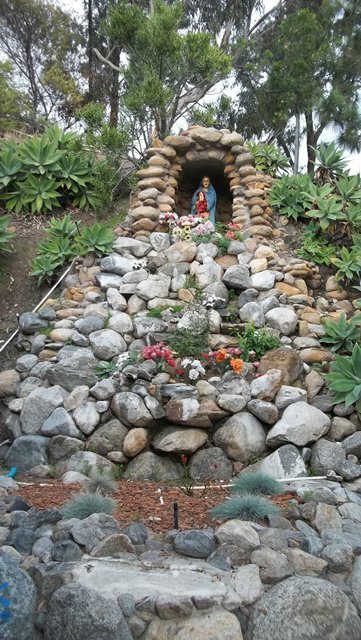 I’m hesitant to provide the location of this alter for fear the ACLU, Atheist group or an overzealous Agnostic will sue the fine City of San Ysidro to have it removed, like they have done to so many other structures of faith; in effort to force their beliefs or lack thereof on others. Back on route I run past La Nola Hotel built sometime in the late 1920’s. It provided shelter to many of visitors in San Ysidro hay days and years to follow during Prohibition. 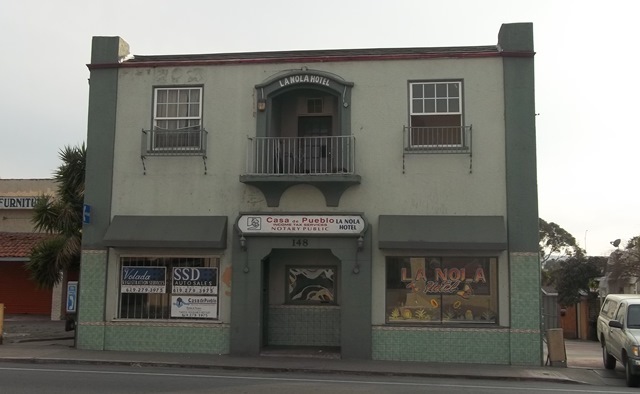 La Nola Hotel housed many visiting Tijuana in Mexico where gambling houses, race tracks, alcohol and prostitution was legal. Just down the street you can buy feed and hardware at the San Ysidro Feed and Supply. Bought in In 1940 by Joseph and Virginia Cuen this feed store was the only one in a 50 mile radius but more important to history then the feed and supply was Virginia Cuen; to this day everyone knows who she is by the name she was given when she worked for Convair Aircraft, she was of course the one and only “Rosie the Riveter.” Welcome to the US Port of Entry! 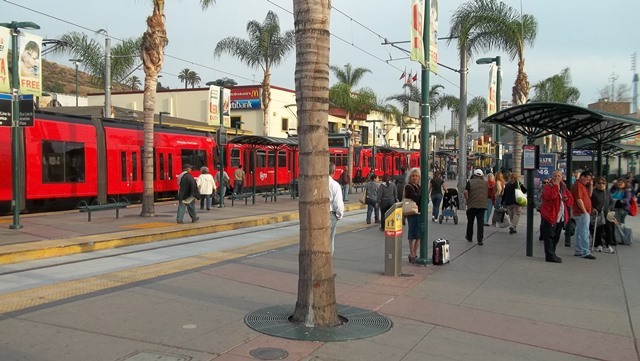 This is not only where you cross to and return from Mexico it’s also the last stop for the San Diego Trolley System. The main brown building houses the Department of Homeland Security; Border Patrol, Customs and Immigration you will have to pass though this building in order to return to the US. 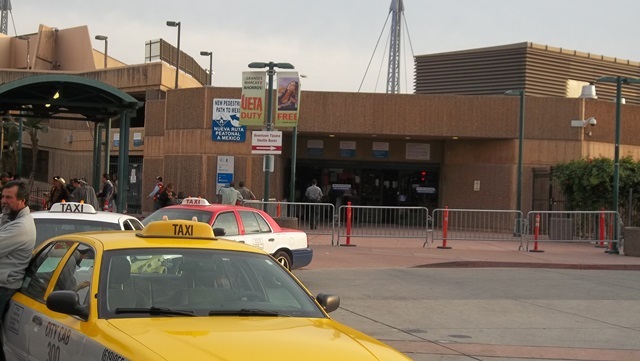 On the left side of the building just after the end of the trolley tracks is where you will find the turn stiles that provide entrance into Mexico. 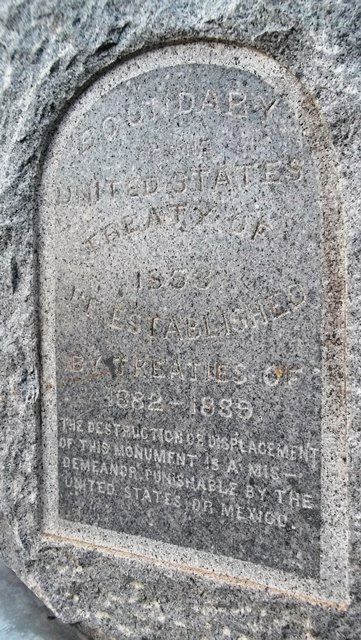 If you look closely around the plaza area near the pedestrian bridge you will find the center part of the original Boundary Monument #255. Having washed away in a flood sometime in 1891 or 1895 this part of the original monument was found in 1979. Sadly vandals have smashed and defaced all but one side of the piece of history. 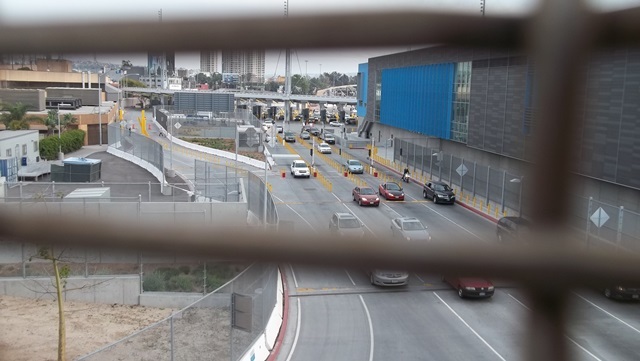 Crossing the pedestrian bridge you can get a view of traffic leaving and entering Mexico, this was Friday traffic. You can also get a nice glimpse of enormous Mexican Flag and Arch on Revolution Blvd. 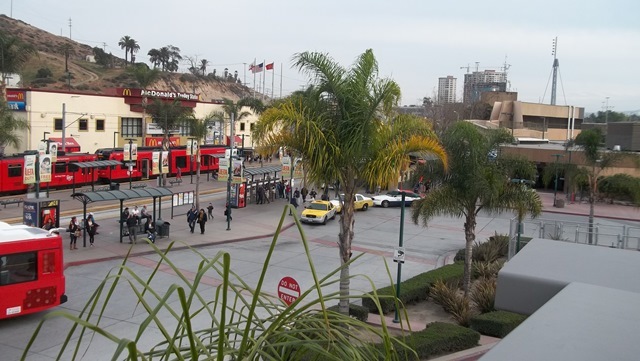 in Tijuana, Mexico. From here I ran back a different route then from where I came; though barrios and along the trolley tracks. I hope you enjoyed my run as much as I did. Check out the rest of the pictures below. This entry was posted in California, Running, San Diego and tagged ACLU, Agnostic, Atheist, Boundary Monument #255, La Nola Hotel, Mexico, Montgomery Waller Community Park, Rosie the Riveter, running, San Diego, San Ysidro, San Ysidro Feed and Supply, Tijuana, tour, US Port of Entry. Bookmark the permalink. Thanks for the tour in pictures! An interesting glimpse of a place well out of my reach. And congrats on the 10 miler too! Glad you like the running tour I’m going to try and do at least one a week. Inspirational. That’s a brilliant run and your hard work is certainly paying off. 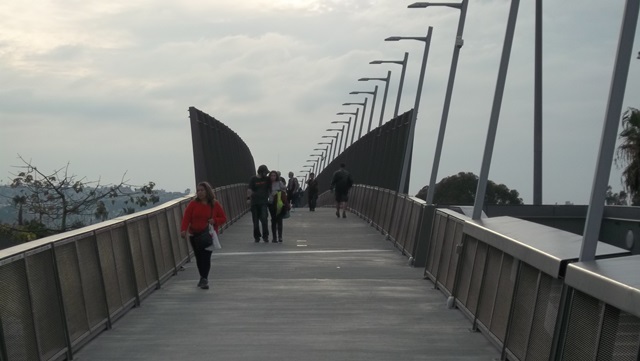 What a great place to live, with so many interesting places so close by. If I took my camera on a run, I would be lucky to fill my posts with anything more than the occasional cow or tractor. San Diego does have its attributes but I’d rather live in a place with cows and tractors 🙂 I grew up in Cattle / Citrus Orchard town and really miss living there. I think I’ve made it to ten by the things I’ve picked up by reading the blogs and advice from bloggers like you so I don’t feel I’ve been alone on this journey and have the blogging community to thank as well. Now I have to make it to 13 miles so that I can enter a half marathon so I can check that off my bucket list. The more I run the less I think these old legs and knees could make a full marathon but I’ll keep pushing my limits and see what happens! I agree the support of others is one of the most important elements in continuing to push ourselves forward. Learning what has worked for others and incorporating it into our own plans. I am confident you can go on to complete at least half marathon distance. My one piece of advice is don’t rush anything, this is a marathon (or half) not a sprint.